Projection: Who Were the Victims in the Ukraine? December 13, 2010 /36 Comments/in Catholic Church, Jewish Religiosity, Jews and the Left /by Edmund Connelly, Ph. D.
The decade of the 1930s was tragic almost beyond description. . . . However, the suffering of Jews pales in comparison to the suffering of the Ukrainian and Russian farmers undergoing forced collectivization. Moreover, Jews were never targeted as Jews, and in general Jews remained vastly overrepresented in elite positions throughout the period, even after the purges. In 1932–33, in Russia and Ukraine —on the very outskirts of Europe, five to six million people died from hunger! And the free press of the free world maintained utter silence… And even if we take into account the extreme Leftist bias of the contemporary Western press and its devotion to the socialist “experiment” in the USSR, it is still impossible not to be amazed at the degree to which they could go to be blind and insensitive to the sufferings of even tens of millions of fellow humans. One powerful clue we have to this twisted mystery is the effort even now to grotesquely turn the genocide of Ukrainians in the 1930s into a story of the victims themselves slaughtering the actual murderers. In a review of a new book, Professor David O’Connell, writing in Culture Wars, finds that canny efforts by those in the Jewish community have again succeeded in getting a Catholic spokesman to do the propaganda bidding of the Jews. To wit, he claims that “the Ukrainians gunned down about two million Jews in 1941–42 by shooting them in the back of the head.” O’Connell considers this absurd. What is happening, he argues, is that Jews seeking to advance the Holocaust campaign (and to hide the crimes of Soviet Jewry) have once again gone trolling for a “useful idiot” to mouth their own message. Furthermore, O’Connell asks, how can Desbois carry out his task of finding and marking Jewish graves, “especially when he cannot speak the local language and has no expert knowledge of either the history or geography of that country?” Well, testimony of very, very old locals—allegedly cross-checked with Soviet archives at the Holocaust Museum in Washington, D.C.—verifies it. “But then, just to make sure, Desbois digs up the bodies, right? Wrong. First of all, there is no proof that Desbois has ever located the remains of even one dead Jew. But even if he were to do so, he would not dig up any remains because the rabbis who pull his strings have decreed that he would be committing a sin if he were to do so.” How convenient. did so because, since the breakup of the Soviet Union, the Ukrainian people have lamented, and tried to tell the world about, their own holocaust, which they call the “Holodomor.” The word refers to Stalin’s program, begun in 1932, of imposing systematic starvation on the Ukrainians because of their resistance to his imposition of collective farming. The man Stalin appointed to lead that effort, which culminated in the extermination of 7 million people, or about 25 percent of the Ukrainian population at the time, was a bloodthirsty Jewish racist and fanatic named Lazar Kaganovitch. In addition, most, if not all, of his key underlings were also Jewish. 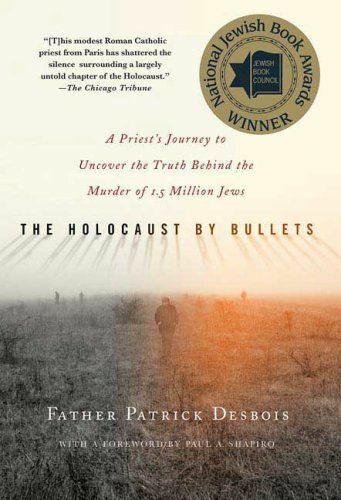 But, in the final analysis, the book’s true purpose is ultimately to enable the Jewish media barons to report on “the Holocaust” as if it were something that happened yesterday, to continue to divide and confuse Catholics by showing them that one of their very own, a priest consecrated to preach Christ, prefers instead to preach the secular Jewish religion of the “6,000,000” while also discrediting the Ukrainian people and their sufferings at the hands of the Jewish fanatics who served Stalin. Once the Jews had discovered him, the collaborationist French bishops made sure he moved up the ecclesiastical ladder. In 1992, he officially began his career as someone who specializes in “dialogue” with the Jews on the diocesan level, when he was appointed as Secretary for Jewish Relations by Cardinal Albert Decourtray of Lyon. He was promoted in 1999, gaining national recognition in the process, when he was appointed as Secretary of the French Bishops’ Committee for Relations with Judaism. Finally, in 2004, the French hierarchy handed him over completely to his Jewish benefactors, and the latter took full control of him. This is an important story, for it instructs us in how Jews can consign their own murderous behavior to a trip down the memory hole, all the while blaming their victims for atrocities against Jews. This kind of projection of genocide needs to be exposed. https://www.theoccidentalobserver.net/wp-content/uploads/2018/06/TOO-Full-Logo-660x156-1.png 0 0 Edmund Connelly, Ph. D. https://www.theoccidentalobserver.net/wp-content/uploads/2018/06/TOO-Full-Logo-660x156-1.png Edmund Connelly, Ph. D.2010-12-13 23:57:212010-12-14 00:05:06Projection: Who Were the Victims in the Ukraine? In the 1930s: Chapter 19 of Alexandr Solzhenitsyn's "200 Years Together"